Wood N’ Tole of the Santa Clarita Valley is a premier wood working shop in the area. 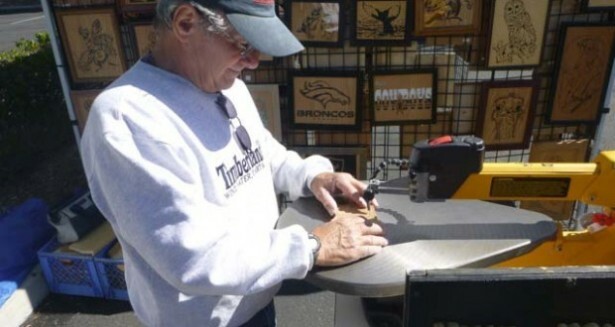 Owner Jim McGuire has been working with wood for many years now. His expertise has created many different projects, each with their own unique twist. While some people prefer to buy a gift from a store, or shopping mall, Jim’s creations are items that can go a lot further. The pieces that he has done have been for birthdays, holidays, graduations and family events. Wood N’ Tole is a business that is located locally in Santa Clarita and caters to the residents of the area. They specialize in all sorts of wood art from portraits to nature scenes and can create jewelry as well. That just shows how much raw talent that Jim has. They use natural wood, eucalyptus, plywood or any type of wood that you would like for your project. The wood work that is done by Jim has been awarded many times. Creativity is a skill that Jim has and capitalizes on. When you bring him an idea of what you might be looking for he is excited to bring your idea to life. Wood working is not something that comes naturally to everybody. Jim has been working with wood long enough, that he has learned how to craft his skill into many memorable pieces for his customers. The creations that he comes up is what gives him joy and makes him happy that his works are so well revered. Wood work can be the perfect gift to anyone. They can appreciate it more, because someone put a lot of time and effort into creating that gift. This is why he likes what he does. It is not a job for Jim, it is his passion. Wood N’ Tole of the Santa Clarita Valley can create wonderful wood pieces for you. The art that is created by them is truly flawless and amazing, as there are no pieces that are the same. The quality of the craftsmanship that is put into each and every item is fantastic. With infinite possibilities, and a creative mind, Wood N’ Tole can build you something.